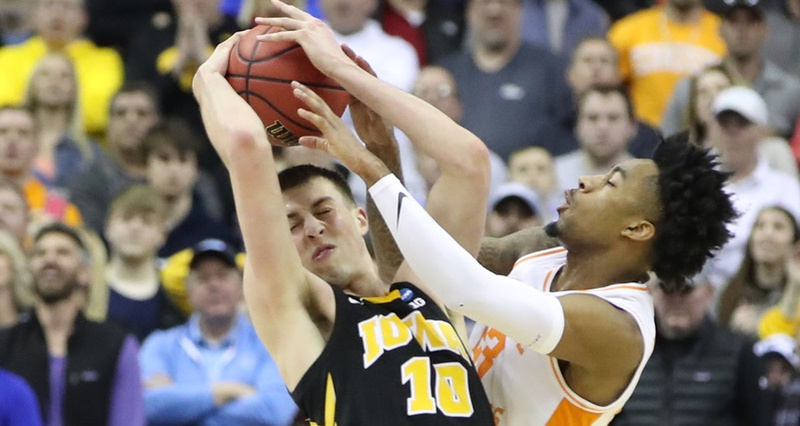 The tenth-seeded Iowa Hawkeyes almost gave us a comeback for the ages Sunday against the second-seeded Tennessee Volunteers in the NCAA men’s basketball tournament, but came up just short. Tennessee took a 44-19 lead with 4:10 left in the first half and looked to be cruising from there, but the Hawkeyes managed to narrow the gap to 49-28 by the half, and Iowa junior forward Tyler Cook scored the first nine points after the break. The Hawkeyes managed to get all the way back into this, outscoring the Volunteers 43-22 in the second half, and if they had pulled off the win, they would have tied BYU’s 25-point comeback against Iona in the First Four in 2012 for the largest comeback in NCAA tournament history. However, Tennessee came through in overtime to pull off a 83-77 win and advance to the Sweet Sixteen. Williams and senior guard Admiral Schofield each had 19 points for Tennessee, with Williams also adding seven rebounds, five assists, four steals and a block, while Bone finished the day with 14 points, three rebounds and three assists. The Volunteers will now advance to the Sweet Sixteen for the first time since 2014, where they’ll face three seed Purdue Thursday. We’ll see if they can have a better second half in that game.